Just reading a friend Jon B’s visit to Turkey on Islamic culture, reminds me of something. 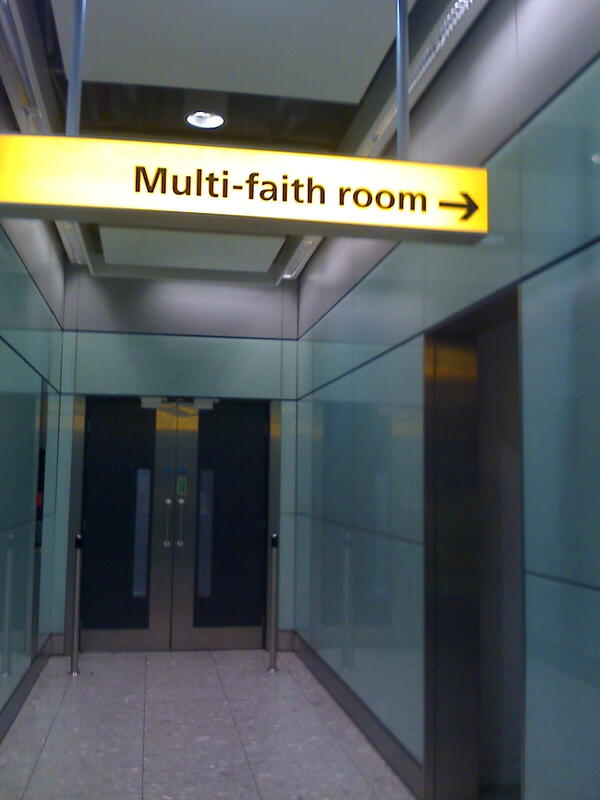 At Heathrow airport I had a long wait for my flight, and I saw a sign about a multifaith room, a kind of politically correct euphemism for a one size fits all church for any faith. There is a church in at least one of the hospitals in Portsmouth, there is also a multi faith centre in the recently built £40m Lymington hospital in the New Forest I worked at sometimes about 18 months ago, when I visited this, I was pleased to see judging by the literature put out it was mostly had Christian books and bibles there. Firstly apologies to the chap bending over, it was hard to get a quickie shot of this place without appearing to be disrespectful. 🙂 When I went in there and first of all unlike any religious establishment there is no symbol on the wall of any deity, or any centre point to make the room significant apart from the screen reminding passengers of upcoming departures. There is a wooden cabinets with labels for Christian, Jewish, Muslim, Hindu, Sikh and other holy books. There are signs asking people to be respectful and not use it as a place to sleep or do baby changing. The place also smells like a gym changing room as people take their shoes off at the door. I didn’t bother at first, but there were five Islamic worshippers here at one point and one of the pointed out I should do the same to be respectful so I likewise decided to comply. Out of the ten people I saw that went in and out of this place nine of them were Muslim, each borrowing a prayer mat from the cupboard, at least two of them were employees of the airport, one was an Indian gent (I think Hindu) with a piece of rope being held in both hands. With some praying aloud in Arabic, it was a little hard to concentrate when I was reading a bible at one point, but it got me thinking. There was a message from a Chaplin about that people should ask permission before leaving any literature in the cabinet to avoid causing offence. I am not sure if the Chaplin has a sit-on-the-fence attitude to the Christian God to try and ‘not offend’, just a general admin bod employed to keep the places clean and tidy, or someone with a real zeal and love for Christ but wants to be a servant to people not following the Lord. Where as we could get alarmed at the number of worshippers of faiths other than Christianity being practised in the UK changes our culture, (and oh how the BNP and similar fascist groups and their ilk love to rub this in) but how many of us Christians actually make the effort to go to one of these places and maybe spend time in prayer before a journey or silently pray for the other users of the room for them to find the loving acceptance of Jesus? Maybe if we did we would have very different faith landscape in the UK. If anyone in church leadership is reading this, I would like to know what you think. Is it a spiritually difficult to pray in a room with people with other beliefs or is worshipping Jesus here could be a good way to pray for others, or are these rooms pointless. Those of you who are Christians travelling to other lands blogging on airport things too. Please let me know your comments. I note the start of this blog refers to a friend’s visit to Turkey and their comment on Islamic culture. Who was this friend? At the end of May when I landed at Gatwick, having returned from Ukraine, there was a tannoy announcement inviting people using the airport to attend a Christian worship and prayer service. It was open to all passengers and their families. I didn’t attend as I had to get home. But it did make me wonder how often that happens and how busy the services are. Maybe next time, time permitting, I will attend such a meeting if not only to show support for my brothers and sisters who are giving to such a valuable and evangelistic ministry. Jon I do agree that we, as Christians, should take time to prayer for and speak to people of other faith and culture. Let’s face it Jesus was a Jew and without inviting his disciples to witness to other nations then Gentiles such as us may never have heard the gospel. Obviously I’m using a slight amount of poetic licence there.